Virpazar is a small town just off the main highway that runs from the inland capital Podgorica to Bar on the Adriatic coast. The small turning runs across the single track railway towards the Voli supermarket and Hotel Pelikan. The road runs past, soon-to-be busy cafes and tourist agencies set in a small plaza towards an old stone bridge where, in the Spring sunshine, men fish with long-practiced concentration. This is fishing to live not pleasure; large fish are wound from the water and tossed into plastic buckets without a backward glance. Even so, the bridge fishers appear to be the social hub of the town and the work, even in a cold March wind, congenial, although the occasional exchanges, smiles and sideways looks suggest competitions running their course. On the far side of the bridge is the small harbour and then a hotchpotch of apartments rising up the steep hill. A rock outcrop at the harbour entrance supports a dramatic statue to the Partisans. This was one of the first towns to resist the Italian occupation in 1941. The bridge and the town either side make an untidy bow tie with a large flooded wetland, much inundated with willow and reed to the south and the huge reed-fringed Lake Skadar to the north. The harbour shelters a medley of canopied tour boats and smaller, sharp-pointed fishing skiffs (locally called cun) and more fishermen line the harbour edge and sometimes the far bank. Lake Skadar (Skadarsko Jezero in Montenegrin and Liqeni i Shkodrës in Albanian) from the road above Virpazar. The lake in Montenegro is a National Park. Fishing appears to be the life blood here and there is no apparent animosity with the birds that crowd the water. The most numerous are Pygmy cormorants, which dive for small fish, swim and fly past in a constantly busy scene. These black birds with their ruffled necks of burnt umber have great chutzpah; they only stop swimming and diving when they hang out to dry and then sit upright together, always at a distance from one another; black candles on bare-branched willows. A solitary great white egret hunts from a favourite tree stump and barks grumpily when disturbed. Black-headed gulls loiter, pick and swim with the cormorants and little grebes keep up their territorial shouting match. Coot and great-crested grebe are visible from the shore as are one or two Herring gulls and the occasional but distant grey heron. In the evening, small fish dance on the water chased by larger fish, the fishermen keep fishing and talking over the see-see-soo whistle of the ever zipping kingfisher, and grey and pied wagtails bound over calling. 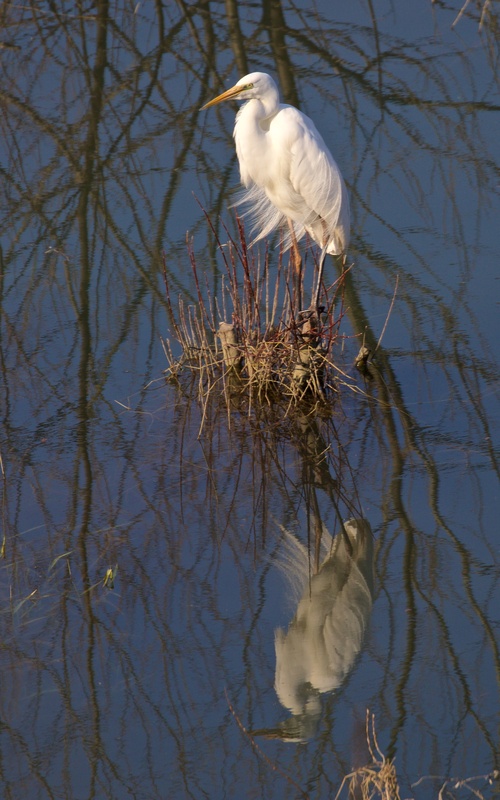 A great white egret on the stump. The winter rain has filled the lake such that it has expanded by a third from its summer low. 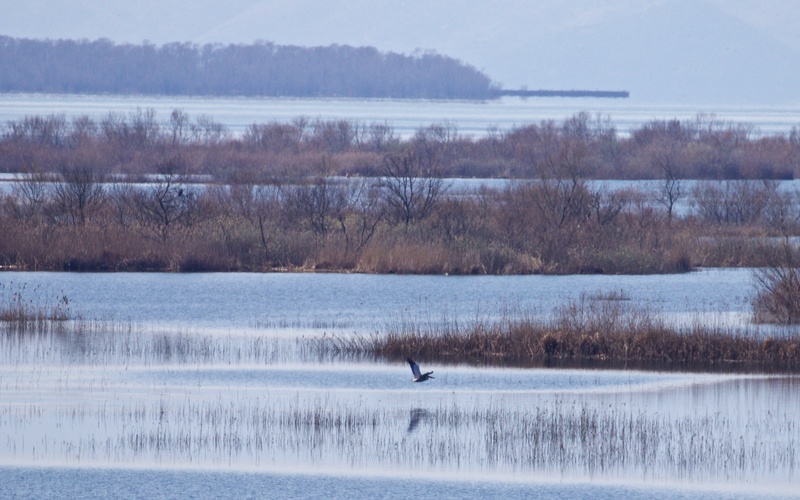 Lake Skadar is some 40km long and a quarter or so of the eastern section is Albanian. Skadar (Shkodër) is a large Albanian town on the far edge of the lake. There are extensive reed-beds nearshore around Virpazar and on the north shore but the great majority of the waterbody itself is flat, blue and empty, and overlooked by a white-capped, Mussorgsky high, mountain range to the north and softer, rounder Rumija mountain to the south. It is a natural landscape, if you ignore the busy main road and single track railway that run north-south and cuts off the western end of the lake. There is only a distant Monastery and pepper of fishing boats to indicate that people have settled here. At the eastern end of the southern shore towards Ostros, an old island monastery and minaret within one of the many Muslim villages, fringed by olive groves and freshly ploughed patchworks, stand across the water from one another. 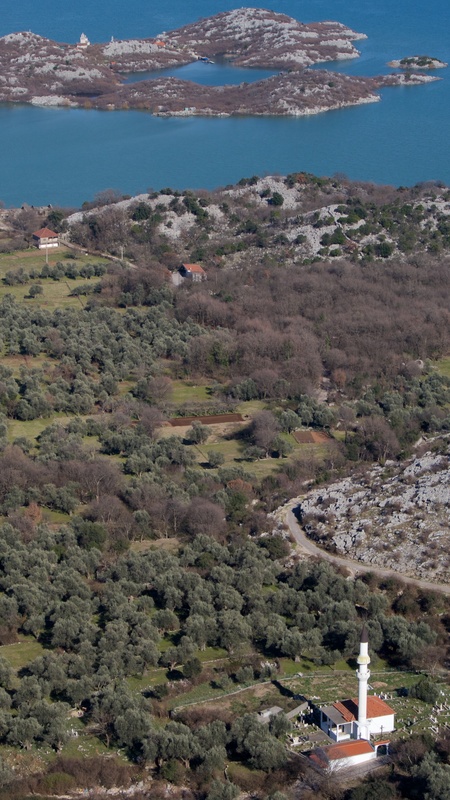 The olive trees shine with early Spring growth. Beska Monastery and Donji Murici Mosque. On the north shore, past Tuzi and close to the border crossing, there is a birdwatching watch tower and an array of signs explaining the lake’s important biodiversity. I sat up there one cold, bright morning looking into the sun, knowing this was the side that the Dalmatian pelicans preferred but with no expectation of seeing a thing. The same array of birds as at Virpazar was present; little grebes and coots all fighting noisily and aggressively for the best habitat patches, magpies scolding and a lone marsh harrier hunting just above the willows. Then by special appearance in the far distance a pelican glided in and settled on the water, scooped and gulped a fish! These, surprisingly, are the most elegant of birds in flight; even though they are huge they have the most graceful, slow, wing beat and they sail the skies like schooners. All the more remarkable, considering how much like sad clowns they look when viewed waddling around, waiting for a tossed fish, at zoos. A solitary and distant Dalmatian pelican. Viewing the lake from the land is not easy from any shore and you can never get in amongst the lily, reed and willow. No wonder the boat trips from Virpazar are a popular day out followed by a fish supper in one of the many restaurants.